Not well understood, but 180,000 possible, globally (includes adults and immatures). Powerful flight; wings held in a deep "V" while soaring, outstretched while gliding. Walk. Diurnal; spend about 80% of their time in flight. Diverse diet: hunt mammals (ranging in size from small rodents to small-to-medium sized antelopes), other birds, reptiles, and less frequently, fish and termites. Scavenge on carrion. Highly variable. First flight at 93-194 days; post-fledging dependence up to 4 months. Greet one another by lifting wings, "bowing," and vocalizing a loud "haow"
© 2015-2018 San Diego Zoo Global. CITES Status updated Aug 2018. We wish to thank Dr. Rick Watson and Beau Parks for providing expert content review of this fact sheet. Dr. Watson studied Bateleur Eagles in South Africa in the 1980s and is among the first to systematically describe the reproduction, ecology, and population dynamics of the species. He has spearheaded research and conservation efforts for a variety of African and Malagasy raptors and currently serves as Vice-President and Director of International Programs for The Peregrine Fund. Mr. Parks has extensive experience working with raptors and has spent 10 years working with birds under managed care in zoological facilities. 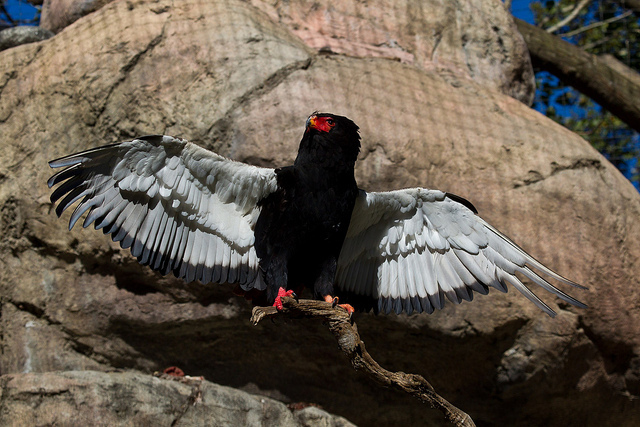 He is currently a Senior Keeper with the San Diego Zoo Avian Prorogation Center.